Warm up quickly with a big bowl of this hearty and delicious chicken soup. Perfect on a cold winter night! 1. 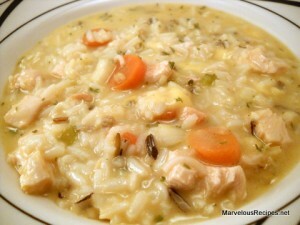 In a large saucepan over medium-high heat, combine water, rice with contents of seasoning packet and soup mix. Bring to a boil. Reduce heat; cover and simmer over medium-low heat for 10 minutes. Stir in celery, carrot and onion. 2. Cover and simmer for 10 minutes. Add cream of chicken soup and cubed chicken. Cook 8 minutes longer or until the vegetables and rice are tender. Yields 5 servings.